For fly fishing the angler uses specialised equipment to achieve this cast. This includes the fly rod, fly line, leader, tippet, and fly. 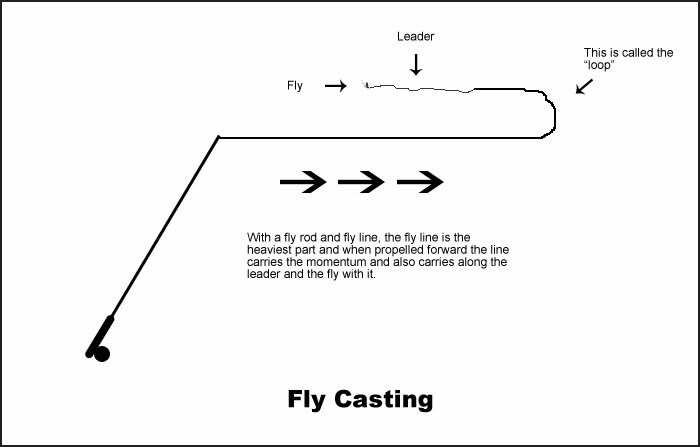 The main difference in casting a fly is that the artificial flies used to catch fish have very little weight to them compared to traditional bait. Even when you get into fly fishing for bass or pike with the much larger flies, the weight to those is still very minimal in comparison to casting a spinning lure or other traditional bait. Unlike other casting methods, fly fishing can be thought of as a method of casting line rather than lure. Non-flyfishing methods rely on a lure’s weight to pull line from the reel during the forward motion of a cast. By design, a fly is too light to be cast, and thus simply follows the unfurling of a properly cast fly line, which is heavier and tapered and therefore more castable than lines used in other types of fishing. Fly fishing is fun, relaxing and easy to learn. You can fly fish anywhere, from the shore of a lake or from a boat on the ocean waves. To start fly fishing you need a fly rod, a line and some artificial flies. Fly fishing for trout is a very popular sport, which can be done using any of the various methods and any of the general types of flies. Many of the techniques and presentations of fly fishing were first developed in fishing for trout.